The Smith and Wesson SD9VE handgun is an excellent weapon for self defense and concealed carry. However, it can get a little tricky to find accessories for it, especially when it comes to sights or holsters that fit your SD9VE. The white dots on the original sights are perfectly useful, but upgrading to night sights or fiber optics might bring your defensive operations to a totally new level. We did the dirty work for you, and we found the best Smith and Wesson SD9VE sights on the market. When looking online, almost all S&W holsters and accessories are marketed for the M&P series. In some cases, accessories for this series are also compatible with the SD9VE, but you have to do your research. Even then, some sellers have accessories compatible with the SD9, but not the VE line. On top of that, the SD9VE is also considered part of the Smith and Wesson Sigma series. You can see how this may all get a little confusing! We’ve selected some fantastic sight upgrades for this review, so you can feel comfortable choosing from any of the four below. Materials – The SD9VE fiber optics sights offered by Truglo are listed for the Smith and Wesson M&P, but they fit perfectly with this model as well. Yes, despite the seller page expressing that they are not compatible with the VE models, multiple reviewers and gunowners have tested this product, and they do work with your SD9VE. 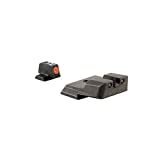 The Tri-Dot aiming system offers contrasting colors on the front and rear sights. A bright red fiber optic is visible at night on the front, and two green fiber optics in the rear are easy on the eyes. The rear sight features a classic U-notch. All three fiber optics are housed in durable materials finished with Truglo’s Fortress Finish. Performance – Whether you don’t quite have the money to spend on tritium night sights, or you simply don’t require that, then a pair of SD9VE fiber optics sights is the way to go to upgrade from the original iron sights on the handgun. We like the contrasting green and red fiber optics in the rear and front sights, respectively. Because the green sight will be softer against your eyesight, but the red optic is still strong enough to be visible in low light situations. We know some may be a little hesitant, since the seller page says it’s not compatible with this S&W model. However, if you take a look for yourself, you can see many others say it’s quite the contrary. Make sure to have these fiber optics professionally installed, and you shouldn’t experience any problems. 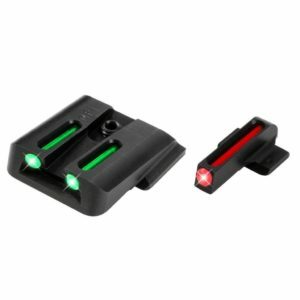 What we say – The Truglo Fiber Optic Sight Set is the best choice for those who want an inexpensive upgrade to their original sights and need contrasting colors for better target acquisition. These also happen to be the least expensive option within this review! 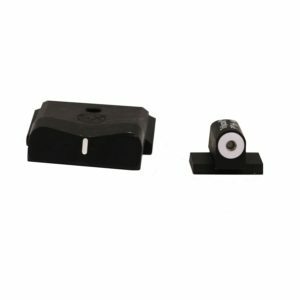 Materials – This set of front and rear night sights from Meprolight are housed in aluminum, which has and anodized finish in matte black. There are three tritium inserts: two in the rear sight and one in the front. 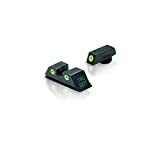 Each insert is surrounded by a white painted dot, which reflects light glares and provides a contrast against the green tritium for easy target acquisition. This product was designed to be compatible with full size and compact 9mm and .40 caliber pistols from Smith and Wesson. Meprolight also offers a 12 year manufacturer warranty on the tritium inserts. Performance – If you’re ready to take the leap towards a pair of night sights, this offering from Meprolight isn’t too expensive and has a very simplistic style. Keeping it easy, the green tritium and white painted dots contrast very nicely. Some gunowners choose different color painted dots because they’re easier on the eyes, but the white is the best at reflecting light and glares. With the 12 year warranty, it’s hard to go wrong. Keep in mind, this warranty is for the tritium, not the housing. A classic U-notch rear sight means you’re not going too far beyond what your original SD9 VE sights looked light, so it should be an easy transition for you. 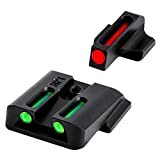 What we say – The Meprolight Night Sights are the best option for gunowners who don’t want to change much from the original sights on their weapon and simply want to upgrade to tritium. Materials – The Big Dot sight from XS Sight Systems is a popular and unique offering. Although not a night sight, it’s a great upgrade to your stock sights without diverging from the classic three dot system by too much. 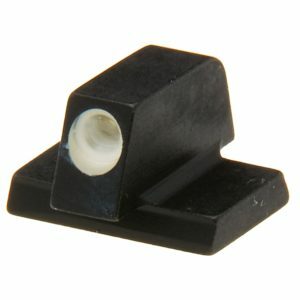 The rear sight is a slightly curved piece, featuring a single white dash to line up with the front sight. It has also been designed to prevent obstructing the view of the front sight while moving. The front sight itself is where the “big dot” comes in to play – the large, white painted ring improves target acquisition and accuracy for those who need a little more assistance focusing. The white painted areas on both the front and rear sight will reflect light glares, giving a better visibility in low light situations. Performance – Diverting from tritium night sights, the Big Dot set from XS Sight Systems is one-of-kind. This option is particularly best for people who have a difficult time focusing on small dots. Hey, we can’t all be perfect shots – that’s what sight systems are for anyways! This option also features reflective white paint, but this is the only choice that uses a single line on the rear sight instead of a pair of dots. This combo gives the shooter a single line to focus on, and you won’t lose sight of the big dot as you move your weapon with your target. If you’ve never experienced this style of sights before, it may take a little getting used to, but you’ll improve your overall accuracy in the long run. What we say – This style of sights for your S&W SD9VE is the best choice for those who need a larger focal point. Maybe you vision isn’t what it used to be, or you just need a little extra assistance. Materials – Finally, we come to the popular Tijicon night sights. 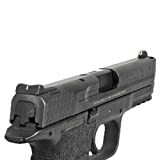 Trijicon offers a set of both front and rear sights, and the seller page does state that they will specifically fit your Smith and Wesson SD9 VE. Each set includes three green tritium inserts: two in the rear and one in front. It is available to purchase with all white painted rings, an orange front ring, or a yellow front ring. The paint reflects light glares and offers contrasting tones of your choosing to enhance your accuracy and speed. Each tritium inserts is capped with a sapphire jewel to evenly distribute light output and protect the lamp from solvents and punctures. Performance – Rounding this review off with another night sight option, Trijicon offers the most comforting selection. By this, we mean you have the most choices from the brand and the seller page offers options made specifically to fit the S&W SD9 VE (finding this for sigma series pistols is difficult)! You’re going to get one of the best levels of quality from Trijicon, and you’ll get a warranty on the tritium as well. All of the painted rings contrast with the inserts, but the orange and yellow options will be softer on the eyes, if that’s important to you. Plus, the paints rings give you a wider focal point to aim with. Really, the only downside to all these features is that you’ll be paying for it! This is the most expensive option within this review. What we say – The Trijicon night sight set for your Smith and Wesson is the best choice for those who want options, options, and more options. There’s no guesswork involved. 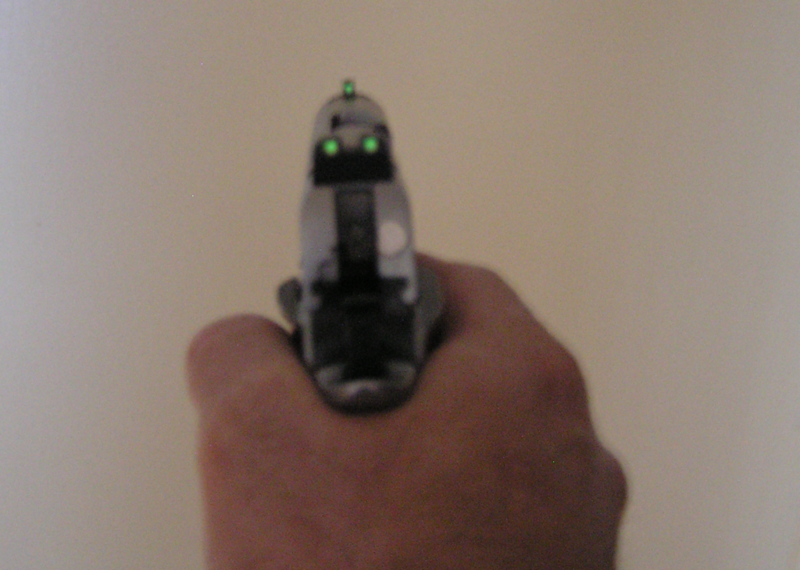 Our favorite sight for the Smith and Wesson SD9VE was the Meprolight Tru Dot Night Sight. First and foremost, of course we are going to pick a night sight over fiber optics or no optics at all. If it’s this affordable, it’s better to select the option that allows you to aim during any lighting situation. The classic painted white dots are the best for reflecting lights, which the fiber optics sights are also lacking. Plus, tritium is practically a no-maintenance optic. The inserts last for well over a decade, if they’re taken care of well. On top of that, it comes with a warranty anyways. We highly suggest looking to Meprolight for your sight upgrades.